Assisted emigration from Ireland to Boston & Quebec. 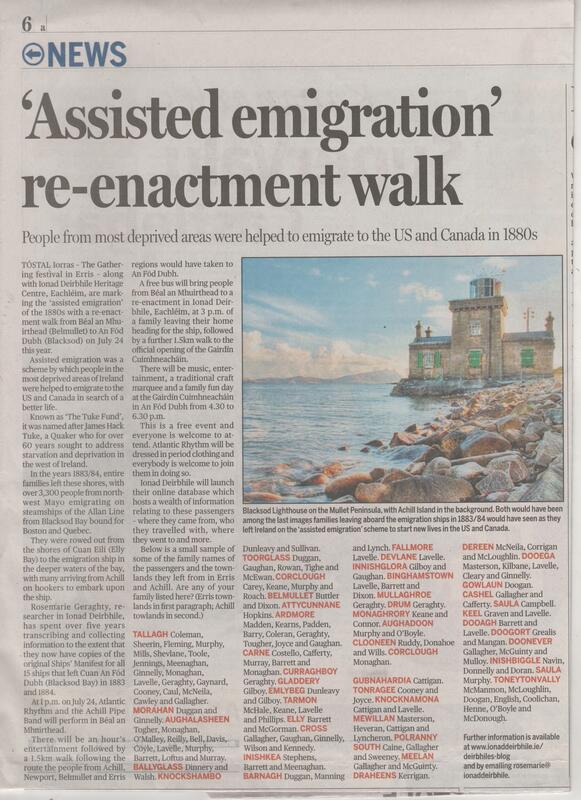 Tóstal Iorras, The Gathering Festival in Erris, along with Ionad Deirbhile Heritage Centre, Eachléim, An Fód Dubh, Blacksod are marking the “Assisted Emigration” of the 1880s with a re-enactment walk from Béal an Mhuirthead, Belmullet to An Fód Dubh, Blacksod on the 24th of July 2013. The Assisted Emigration was a scheme by which people in the most deprived areas of Ireland were helped to emigrate to the U.S. and Canada in search of a better life. Known as “The Tuke Fund” it was named after James Hack Tuke, a Quaker who for over 60 years sought to address starvation and deprivation in the West of Ireland. Between the years 1883-84 entire families left these shores with over 3,300 people from North West Mayo emigrating on steamships of the “Allan Line” from Blacksod Bay bound for Boston and Quebec. They were rowed out from the shores of Cuan Eilí, Elly Bay to the emigration ship in the deeper waters of the bay with many arriving from Achill on Hookers to embark the ship. Rosemarie Geraghty researcher in Ionad Deirbhile Heritage Centre has spent over 5 year transcribing and collecting information to the extent that they now have copies of the original Ships’ Manifest for all 15 ships that left Cuan an Fód Dubh, Blacksod Bay in 1883 – 1884. At 1pm on July 24th Atlantic Rhythm and Achill Pipe Band will perform in Béal an Mhuirthead. There will be an hour’s entertainment followed by a 1.5km walk following the route these people from Achill, Newport, Belmullet & Erris regionss would have taken to An Fód Dubh. A free bus will bring people from Béal an Mhuirthead, to a re-enactment in Ionad Deirbhile, Eachléim at 3pm – a family leaving their home heading for the ship, followed by a further 1.5km walk to the Official Opening of the Gairdín Cuimhneacháin in An Fód Dubh. There will be music, entertainment, a traditional craft marquee and a Family Fun Day at the Gairdín Cuimhneacháin in An Fód Dubh from 4.30pm – 6.30pm. This is a free event and everyone is welcome to attend. Atlantic rhythm will be dressed in period clothing and everybody is welcome to join them in doing so. Ionad Deirbhile will be launching their online database which hosts a wealth of information relating to these passengers, where they came from, who they travelled with, where they went to and more. Here is a small sample of some of the family names of the passengers and the townlands they left from. Are any of your family listed here? TALLAGH: Coleman, Sheerin, Fleming, Murphy, Mills, Shevlane, Toole, Jennings, Meenaghan, Ginnelly, Monaghan, Lavelle, Geraghty, Gaynard, Cooney, Caul, McNeila, Cawley, Gallagher. MORAHAN: Duggan and Ginnelly. AUGHALASHEEN: Togher, Monaghan, O’Malley, Reilly, Bell, Davis, Coyle, Lavelle, Murphy, Barrett Loftus, Murray. BALLYGLASS: Dinnery, Walsh. KNOCKSHAMBO: Dunleavy, Sullivan. TOORGLASS: Duggan, Gaughan, Rowan, Tighe, McEwan. CORCLOUGH: Carey, Keane, Murphy, Roach. BELMULLET: Buttler, Dixon. ATTYCUNNANE: Hopkins. ARDMORE: Madden, Kearns, Padden, Barry, Coleran, Geraghty, Tougher, Joyce, Gaughan. CARNE: Costello, Cafferty, Murray, Barrett, Monaghan. CURRAGHBOY: Geraghty. GLADDERY: Gilboy. EMLYBEG: Dunleavy, Gilboy. TARMON: McHale, Keane, Lavelle, Phillips. ELLY: Barrett, McGorman. CROSS: Gallagher, Gaughan, Ginnelly, Wilson, Kennedy. INISHKEA: Stephens, Barrett, Meenaghan. BARNAGH: Duggan, Manning, Lynch. FALLMORE: Lavelle. DEVLANE: Lavelle. INNISHGLORA: Gilboy, Gaughan. BINGHAMSTOWN: Lavelle, Barrett, Dixon. MULLAGHROE: Geraghty. DRUM: Geraghty. MONAGHRORY: Keane, Connor. AUGHADOON: Murphy, O’Boyle. CLOONEEN: Ruddy, Donahoe, Wills. CORCLOUGH: Monaghan. This entry was posted in Eachléim Notes, Events, Genealogy, Historical, News by Bainisteoir CFID. Bookmark the permalink.